I fell asleep last night pondering Steven Silverleaf and Patrick Begg’s responses to an email thread about an upcoming show, and grew increasingly appreciative of their messages. Each in his own way urged us to focus on the successful show rather than anticipating barriers that haven’t even arisen yet. As Patrick so aptly put it, “…instead of concentrating on and listing all the problems, we concentrate on the vision of a community, on what we want - and then figure out how to achieve it.” This feels deeply right to me, but clearly it’s a habit of mind that I have not yet fully cultivated, since my response to the discussion around the show was to elucidate potential problems. I’m grateful to my TBA friends for helping me to see this – maybe next time I’ll move past the quibbles that first come to mind and invoke Appreciative Inquiry. In fact, a recent similar conversation about workshops with Janet and Patrick helped me with some stinkin’ thinkin’ and got me musing about a vision for TBA and the greater local book arts community. I got to thinking that the Triangle is becoming, in its own small way, known as a book arts place. TBA is part of it. The email list serve reaches scores of readers, many quite distant from the Triangle. These “lurkers,” who are beyond our core group of active participants, rely on the list serve to stay informed about book arts in the Triangle. With an active website, FaceBook and Instagram presence, TBA has positioned itself as a resource and promoter for local book arts. Kudos especially to Patrick for his work here. Our members, including the lurkers in the list serve, move in book arts circles around the country and internationally, where they make sure folks hear about TBA and what's going on in the Triangle. How many times have you heard someone say, “I just got back from [Penland, Codex, PBI, New York, San Francisco, etc.] and people were very interested in TBA and what we are doing?” Perhaps a vision of TBA should include its members being knowledgeable and articulate promoters and ambassadors of the Triangle book arts scene as they move around the country and the world. TBA also has strong ties, especially through individual artists, with the larger local arts community. Perhaps a vision of TBA should include becoming the voice of book arts in the local arts community. 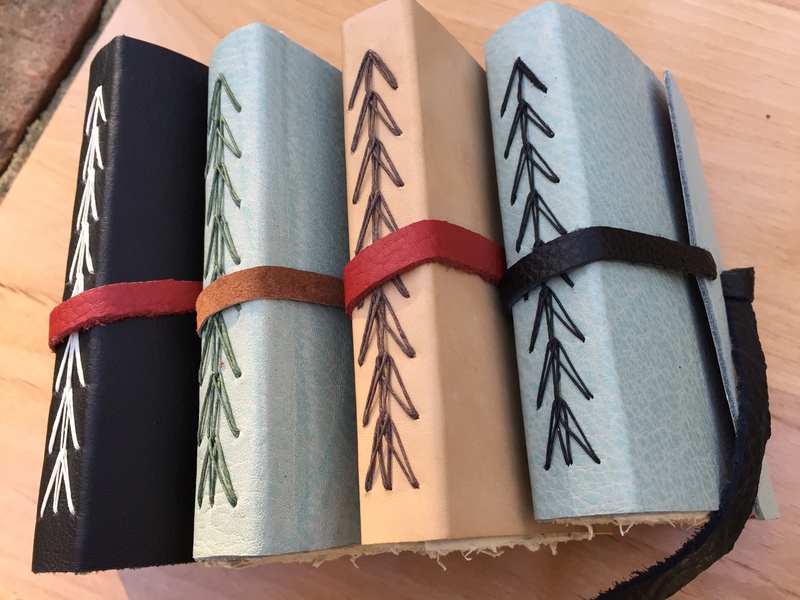 Book arts in the Triangle are flourishing and TBA is only one of many reasons that the Triangle is getting noticed in the larger book arts world. As obvious as it may be, I’m just coming to understand that TBA and its members should be mindful of the larger book arts community in the Triangle as we plan and act. Perhaps this big picture should be included if TBA articulates a vision for itself. For one thing, TBA's experience with far-flung participants coming for workshops is also true for others who offer book-related instruction – Studio 200's workshops and Kathy Seinsberger's Blam workshops, not to mention ArtSpace, DeviledEgg, ScrapX and the various arts councils all attract folks from beyond the Triangle. People outside the Triangle are certainly noticing that Duke and UNC libraries both support book arts. 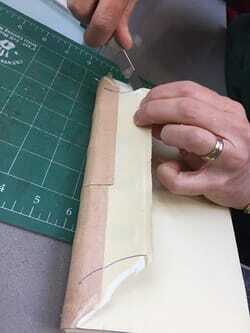 Duke library recently hosted a Guild of Book Workers workshop. Last year, a Duke librarian gave TBA members a tour of the zine collection, and don’t forget the current exhibit of the Baskin Collection. 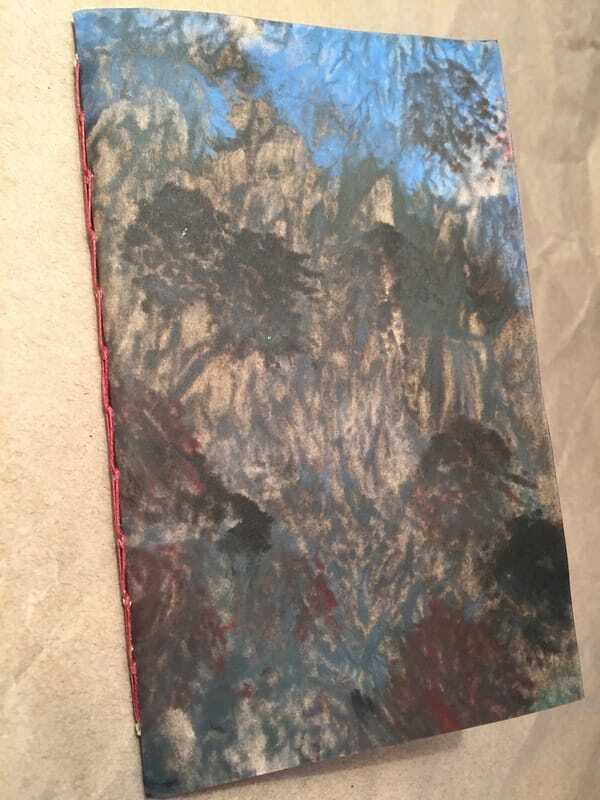 Over at UNC we can enjoy Josh’s inimitable monthly “artists’ book club” at Sloane library. I’d like to include Duke and UNC museums and art departments. How are they contributing to the Triangle book arts scene? The Durham Zine Machine is bigger and stronger every year. Dave Wofford’s work at Horse and Buggy Press is really putting the Triangle on the book arts map. There are artisan letterpress printers, paper marblers, paper makers, book binders, book conservators and book historians. We have talented book artists (You know who you are!) with growing reputations. We are blessed with supportive gallerists who love to showcase book art, especially including TBA’s own RoyLee Duval. I know I've left stuff out of this enumeration, and I expect and hope you will add to the list. That's all pretty cool when you think about it. TBA should be excited to be part of all this. Can we talk about a vision of TBA as the face, or maybe the voice, of book arts in the Triangle? My friend, Nate Jackson, brought me some lovely Hanji when he traveled to Korea. I used some of it for the covers of these Coptic bound sketchbooks. My wife's students in the Durham Academy junior class are using these for reflective journaling on their civil rights tour. They are very simple -- inkjet printed covers and pamphlet stitch -- but Edith tells me that the kids like them. Snow and ice kept me home for three days, so I made five more of these journals. Doing multiples like this helps me improve. I've figured out little things that make the work easier and the product better. Leather and paper linings cut. The top three papaers are my own paste paper/print. Six sheets of Nideggan paper torn down to size for the text. I wish I were better at documenting my book arts journey. In fact, the more important and meaningful experiences are the hardest for me to write about. I struggle, often unsuccessfully, with a sort of fatal procrastination. The new year has brought a spate of "looking back" pieces, giving me a plausible excuse to offer some posts that I should have blogged about at the time, but failed. In October, I took a two-day class with Karen Hanmer, offered by the Potomac Chapter of the Guild of Book Workers (of which I am a member), on the springback binding. The class was located in the conservation lab of the Folger Shakespeare Library and it was a privilege and a pleasure to work in that space. The learning was intense! I had never pared leather before, and didn't know until I signed up that that was one of the requisite skills. It certainly was a challenge to get those edges pared while stretching my other skills to learn this complex structure. Still, I had great fun, mostly because Karen is such a good teacher and the group was pleasant and supportive. The book I made is far from perfect, but I’m pleased with my first effort. The Thursday before the weekend class, Karen gave a wonderful presentation about her work at the Library of Congress. Below: Karen demonstrates a few of the steps. A recent email from my mother-in-law included the phrase "bad mushroom," which made no sense and was clearly autocorrect at work -- the inspiration for #4 in the Autocorrect series of small blank books. That was today's project, the first of 2017. I ended 2016 with a couple of small journals covered with my own paste paper. After some time away visiting my daughter for the holidays in Texas -- my first ever trip to the Lone Star State! -- I came home and made another limp leather journal. I really enjoy making these. The leather is from the Durham Scrap Exchange and the paste paper lining is my own. Text paper is Nideggen. To the great pleasure of her family, my 92 year old mother-in-law is a very active email correspondent. Her emails are extra fun to read because she just taps along on her ipad and never reviews or corrects, leaving a message strewn with typos and autocorrect clangers. I have taken some of the more charming autocorrects and paired them with public domain images from the NY Public Library (What an extraordinary resource!) to create this new series of little blank books. 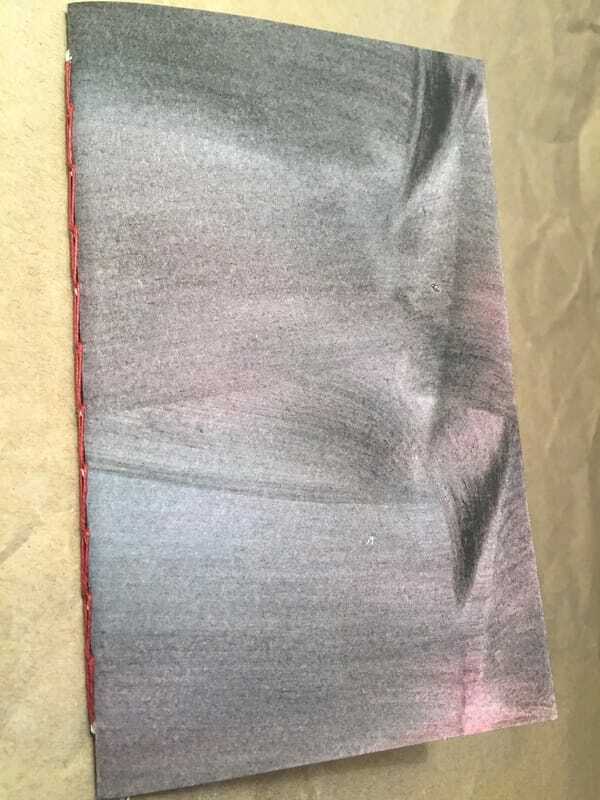 My own paste paper. Key: short Mage was supposed to be "shortage" / years Cato, "years ago" / we haven't figures out small kvetch -- the best guess is "smart alecs." In October, I attended a workshop led by Karen Hanmer, a wonderful book artist and a fine teacher. The two days were long and the learning was intense, but the other participants were fun, interesting and kind to a relative newcomer to bookbinding. Notably, this was my first experience of paring leather. While the book I completed is far from perfect, I am pleased with it as a first effort. The leather for these journals came from the Durham Scrap Exchange. (I think the blue/green ones used to be a couch!) The triple chain sewing is presented in Keith Smith's Non-Adhesive Binding, volume II. 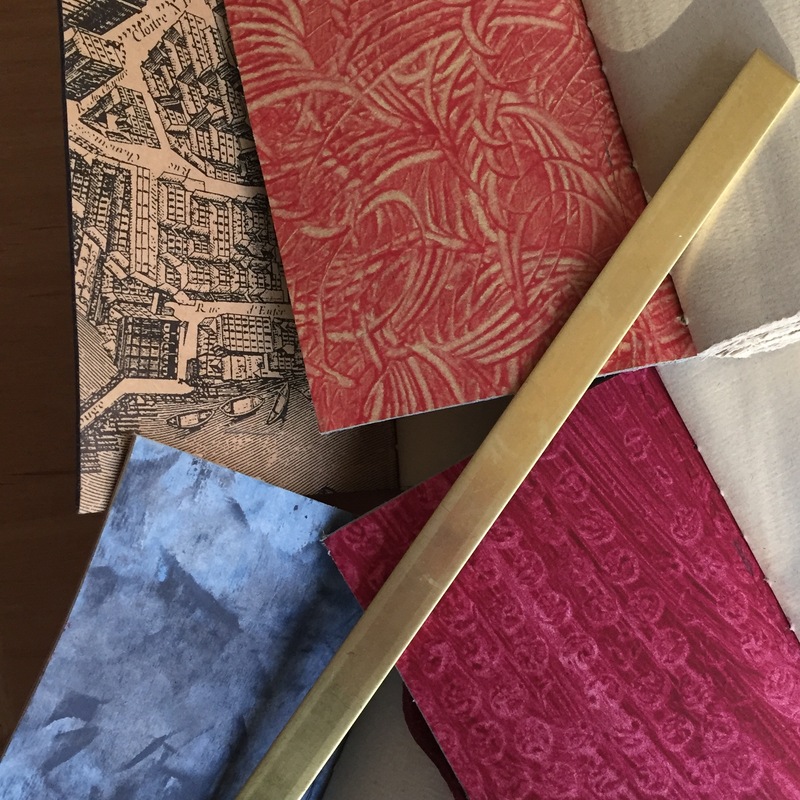 The printed lining paper was wrapped around a purchase from the gift shop in the Louvre. The paste papers are my own. Text paper is Nideggan.